I have one brother, Shane. He graduated from college with a degree in Law Enforcement in 2001. Shane loves sports, listening to music, and nice cars. My parents divorced when I was five, my Mom lives in south eastern North Dakota and my Dad recently moved back there from St. Paul, Minnesota. My Mom and I are very close, she is the other horse person in the family! Below is a picture my Dad and I celebrating Christmas in Wyoming in 99, a Senior pic of Shane and one of my Mom and I during my rodeo queen pageant in August of 2000. I have to also mention some of my close friends. In one years time, when I was 15, my four best friends were gone from my life. Two moved far away, and two died in car accidents. Needless to say it was a difficult time in my life, I still miss them very much, see my "In Memory Of" page. I have several friends that live far away and I don't get to see very often but we keep in touch. These are Danielle from Arizona, Angie from Minnesota and Amber from North Dakota. I became very good friends with my two roommates from college. They are also graduates of the Veterinary Technology program. Tricia is a sweetheart and loves Beagles! She works as a Vet. Tech. in Minnesota. Angie is cat obsessed cheesehead (originally from Wisconsin) and is one of the kindest people I have ever met. Below is a pic of Trish and I and also Angie, Derek, and Doug at a friend's wedding. up for Halloween. 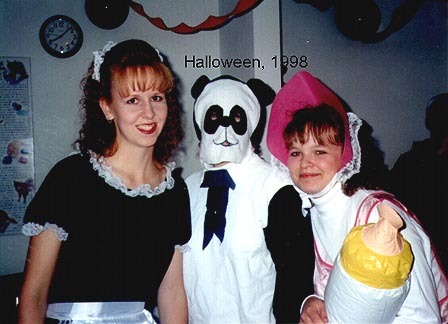 I was a French Maid, Tricia a baby, and Angie a Panda Bear! We had a blast! I have made some good friends since I moved to Wyoming. Angela is so nice and always willing to lend a hand. Annette is another good friend, she is like an angel on Earth. And then there's Sara, she is a kick in the pants! We have tons of fun together!